The Discover Eskdale Centre is now open in St. Bega's Church , Eskdale Green. The display is a fabulously illustrated view into the life, times and landscape of Eskdale throughout the ages. 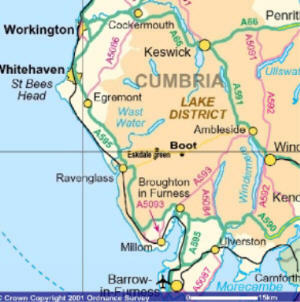 Click on the Map to get information about towns and villages on the West Coast of Cumbria. It probably comes as little suprise that Eskdale has so many beautiful gardens. The combination of rich soils, mild winters and the odd shower or two, create perfect growing conditions and of course, the setting provides the inspiration. MUNCASTER CASTLE'S gardens are the area's showcase,with miles of beautiful walks, avenues of rhododendrons, glades of native plants and more specialist species, a wild flower meadow and beautifully situated terrace gardens. Although the gardens are best known for their late spring displays there is hardly a month in which a different aspect of the garden does not command your attention. GATEHOUSE ESTATE, now the Outward Bound Centre, was originally planted in 1901, when James H. Rea and the famous landscape architect, Thomas Mawson, set about the creation of 'a garden to rival Lord Muncaster's estate'. Although now in slight decline, there are still superb shrubberies, specimen trees and a lovely series of cascades. If you are staying at Gate House you will have all of this to enjoy, otherwise make a point of strolling round the grounds at the Eskdale Fete. THE JAPANESE GARDEN, in Giggle Alley forest, was the jewel in James Rea's horticultural crown. Following decades of neglect the garden is now being caringly restored by local volunteers and Forest Enterprise. There are thickets of bamboo, a stunning display of Japanese maples and the heady scent of azaleas in the spring. The whole forest is open to the public and makes for an ideal Sunday afternoon walk - just far enough to shed an ounce or two of sticky toffee pudding. The best thing about gardening in Eskdale is that you can borrow a bit of the view - Harter Fell behind the camellia, no problem. On a slightly different scale DON RICHARDS' HEATHER GARDEN heads a star cast of gardens that are 'opened', for charity, at various times of the year. I am always wary of those wayside 'poterie' signs, in France, that have you doubling-back up 60km of woodland track only to be met with a grouchy Gallic gesture. So here is a guide to Eskdale's arts and crafts haunts, all of which are less than a pot's throw from where you are staying. FOLD END GALLERY, in Boot village, looks deceptively small, from the outside, but there is a treasure trove within. A welcome mix of paintings, pottery and prints, as well as a range of individual but affordable gifts - whether you are spoiling yourself or looking for a more distinctive present, the gallery is certain to have something that fits the bill. SANTON BRIDGE CRAFT & GIFT SHOP, near The Bridge Inn, has been described as an Aladdin's Cave of gifts and ideas. As well as paintings and prints, the shop sells quality knitwear, jewellery, sheepskin products, books and toys, and there's The Woodlands Tea Room next door. THE OLD BUTCHER'S SHOP is only a few hundred yards from La'al Ratty's Ravenglass station and, as you might well expect, has a wide range of gifts with a nautical theme. You can also buy framed photographs, cards, gemstones and preserves - a gift for all budgets. GOSFORTH ARTS & CRAFTS is close by, with a good selection of gifts, baskets and furniture, so it makes sense to visit the two shops together. Slightly further afield, but well worth the detour, are SPINDLE CRAFT, at Drigg station, which bursts with crafts, gifts and a bit of inspiration, and LOWES COURT GALLERY, in Egremont, which has exhibitions throughout the year in addition to its permanent craft display.